A swim between the Henley and Grange Jetties has been a feature of Australia Day celebrations in South Australia for over 100 years. 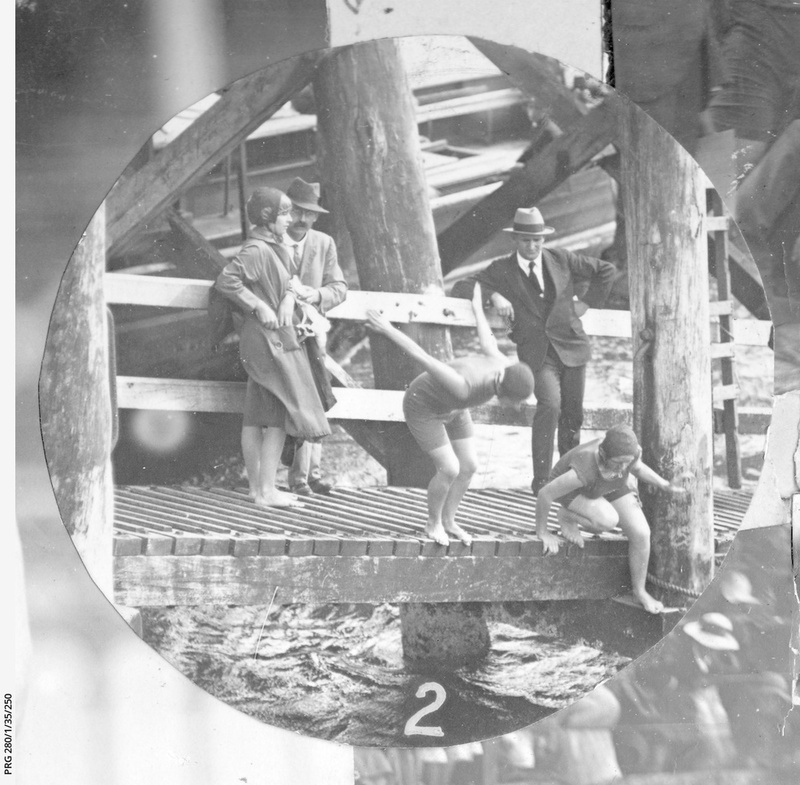 The tradition began in 1917 when the Henley and Grange Swimming Club held the first event. Masters swimmers began competing in 1983 as a seperate group of swimmers. Interest from Masters swimmers has grown and to this day remains high. 2002 saw the first Masters Swimming (SA Branch) Jetty to Jetty Australia Day Long Swim for swimmersover the age of 18 years. The SA Branch undertook this swim to maintain the tradition of a long swim between the jetties on Australia Day. Such a swim has very strong support from Masters swimmers and the SA Branch hopes that the event will grow in stature in coming years to rival some of the open water long swims in other states. In 2004 the age limit was dropped to 13 years due to interest from younger swimmers and the absence of any alternative events for "budding" young distance swimmers. As of 2014 the event changed back to swimmers 18 years and over due to insurance issues. We partnered with SwimmingSA in 2018 to continue the tradition with swimmers 11 years and over able to participate again i the this great long swim! We would like to thank Masters members for their strong support and commitment to this event and wish all competitors a safe and enjoyable swim! Along with our sponsors, Nine News and Bendigo Bank, we have on board a new sponsor for our 2019 swim, “Australia Swims”. 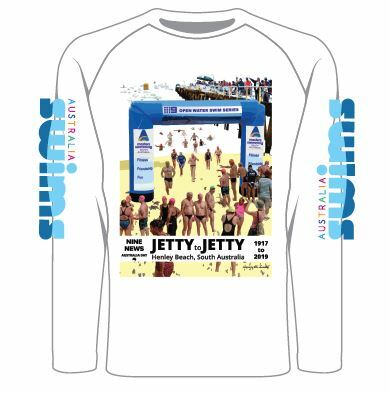 The Official Long Sleeve T-Shirt will be available when you register online for the 2019 Jetty to Jetty at the cost of $30. These ordered T-Shirts will be able to be collected on the day of the swim. The T-Shirt will be available for order on the day for a cost of $40 which includes postage. Fastest Female Swimmer (Wingate Trophy) - A perpetual Trophy donated by Masters Swimming SA. Fastest Male Swimmer (Ted Geary Trophy) - A perpetual Trophy donated by Masters Swimming SA. Age Group Winners - The following Age Groups will apply in both Male and female. First, Second and Third Placegetters in each age group (Fastest Times) will receive awards. Oldest Male Swimmer (Darryl Hawkes Trophy) - A perpetual Trophy donated by Masters Swimming SA. Oldest Female Swimmer (Simons Trophy) - A perpetual Trophy donated by Masters Swimming SA. Nine News Jetty to Jetty Team Award - The Nine News Award will be presented to the Masters Club with the most accumulated points. NB. Swimmers must be registered with Masters by the date of the event for the current year of the swim to be eligible for points. Completion Awards - Awards will be presented annually to all swimmers who complete their 10th swim and for each subsequent 10 swims. Trophies will be presented by various sponsors and dignitaries. Perpetual trophies will be retained by Masters Swimming SA each year. Winners will receive replica trophy. Australia Swims is a campaign where people pledge their swimming distances to swim a virtual lap around Australia from 19-28 January. This year they are encouraging people to do this in teams – each team has a Captain and a charity. Masters Swimming Australia is teaming up with Beyond Blue with our Captain being Dawn Fraser AC, MBE and the wonderful George Corones. We expect to get some marketing information from SAL in the next few days and will pass this on. At the moment here are some links for you. The MSA ‘team/swim tribe’ are currently on top of the leader Board. A great video launching Aust Swims. 8 teams, masters get a very good mention. The 2019 Nine News Jetty to Jetty Australia Day Long Swim will be from the southern side of the Grange Jetty to finish on the southern side of the Henley Jetty. Masters Swimming SA has engaged the services of Event Strategies as the official timer and recorder for the 2019 Nine News Jetty to Jetty Australia Day Long Swim.